It depends on the frequencies and the DPLs. If they are common frequencies, there should be no problem, but the Motorola CP200 2-way radios has certain DPL (private digital line) squelch codes that the BPR40 2-way radio will not support. An example would be DPL number code 212 is supported on the CP200 but not the BPR40 at this time. For the most part, the frequencies inside a CP200 can be programmed into a BPR40 a majority of the time. When in doubt check with your local Motorola dealer. This entry was posted in Anything Motorola, Radio Questions on March 27, 2015 by Radio-Admin. Motorola is slowly facing out Nickel-Cadmium batteries in lieu of the superior Nickel-Metal Hydride batteries. You will find it even though some batteries are advertised as Nickel-Cadmium Motorola is now using Nickel-Metal Hydride. Some of the main advantages of Nickel-Metal Hydride over Nickel-Cadmium batteries are capacity, no memory effect and just as important these batteries are more environmental friendly. Nickel-Metal Hydride or NiMH for short, are newer technologies providing better performance, especially with high drain devices. Not only do they deliver more power, and can be charged up to 1000 times, all without the cadmium toxicity concerns associated with Nickel-Cadmium batteries. In short, NiMH batteries are much better than NiCd batteries and Motorola is not charging extra for them. This entry was posted in Accessories Questions, Anything Motorola on March 27, 2015 by Radio-Admin. Yes, there is, a tremendous differences. Motorola accessories in this case the microphone, are specifically made to communicate properly with the radio. This is a two-way relationship between the microphone and the radio. The Motorola microphone was specifically manufactured to protect the radio in many real-life situations. An example would be, if the microphone gets wet and gets a short circuit, there are tremendous circuitry and safeguards in place to prevent the radio from being damaged. This is just not the case with lower price generic accessories. 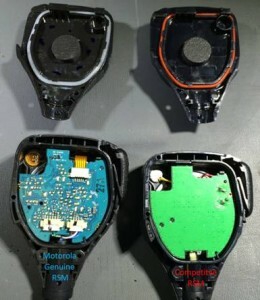 Trying to save $5 or $10 on accessories can increase drastically the chances of your two-way radio being destroyed, in fact, if you were to read the Motorola warranty, it specifically states that it is not responsible for defects caused by third-party inferior products. But don’t take my word for it, this is a perfectly good example where a picture is worth 1000 words. You be the judge, want to destroy your radio that costs hundreds of dollars because you are trying to save 10 bucks? This entry was posted in Accessories Questions, Anything Motorola on March 12, 2015 by Radio-Admin. These are the part numbers for the Motorola original accessories radio programming cables. BRP40 Radio programming cable is PMDN4043 and uses a com computer port. CP110 Radio programming cable is RKN4155 and uses a usb computer port. CP185 Radio programming cable is PMDN4077 and uses a usb computer port. 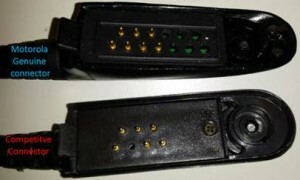 CP200D Radio programming cable is PMKN4128 and uses a usb computer port. * This Motorola Radios need a Motorola Rib Box between the Radio and the computer. This entry was posted in Anything Motorola, Radio Questions on March 1, 2015 by Radio-Admin. This entry was posted in Anything Motorola and tagged Motorola on February 18, 2015 by Radio-Admin.